i thought this would be a good tip for some of you guys that are just starting out. 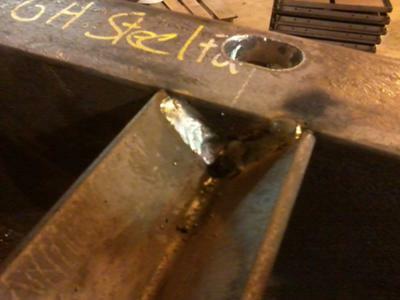 as you know in production mig welding (fabrication) you will encounter some heavy metal. typically you may use .030 or .035 wire but at my shop we use nothin but .045 so when i first started trying to dial in i had a lot of problems. number one tip unless you are doing a down hill or up hill your gonna have to crank the heat up for instance in my first pic im running 22 volts at 280 ipm on a 5/16'' t- joint. so the gap in wire feed to volts ratio isa little smaller. if you look at the second pic you can see that i struggled a bit mainly because the to pieces of material were off by a lot in size and the angle was funny. 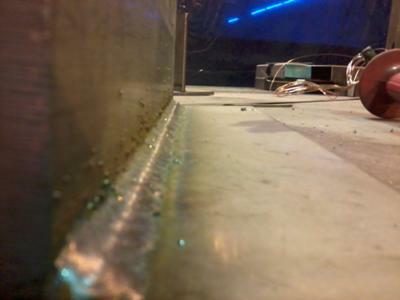 one thing about my shop is we weld mostly dark metal with a lot of mill scale and in this case i didnt have time to remove it and i had a lot to weld so for this thick dirty material i cranked it up to 26 volts and reduceed my ipm to 255.5 and i got it done very fast and very acceptable. bottom line is more heat is needed but play with the settings and see what you get.